Our 2018 British Canoeing Sea Kayak Leader (4-Star)Assessment dates are listed here. 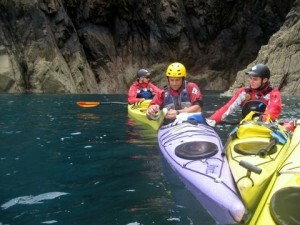 Sea Kayak and equipment hire is included in the price. 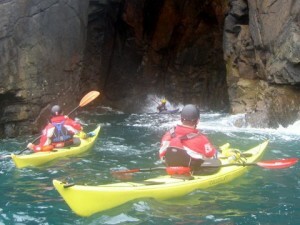 Additional sea kayak leader assessment dates can be arranged. Contact us for advice. The British Canoeing Sea Kayak Leader (formerly called 4 Star) Assessment demonstrates a candidate has the skills to safely paddle and lead other competent paddlers. 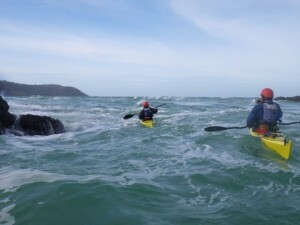 A sea kayak leader will have the paddling ability, safety, rescue and leadership skills to undertake trips on sheltered to moderate water with a group of paddlers who have basic paddling skills but may not have the experience, to operate in a self-sufficient manner. Note. From April 2017 the 4-Star Sea Kayak is renamed the Sea Kayak Leader award. The syllabus remains the same. The sea kayak leader is ideal for sea kayakers who lead groups of 4-5 paddlers on 6-8 mile journeys in moderate tidal waters (winds not exceeding force 4 and sea state 4). The award is an excellent benchmark of your leadership and sea kayaking skills. We aim to assess you in realistic conditions to allow you to demonstrate your natural leadership on the water. Many centres and clubs now use the sea kayak leader certificate as a benchmark to indicate that leaders/guides have a good level of kayak and safety skills. 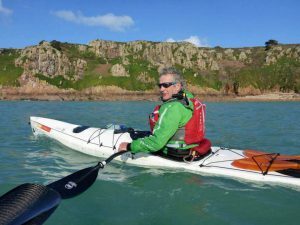 Our sea kayak leader assessment is a great way to benchmark your kayaking and leadership skills in the superb waters around Jersey. Explore Jersey’s amazing coastline of caves, cliffs, rock gardens and surf beaches. 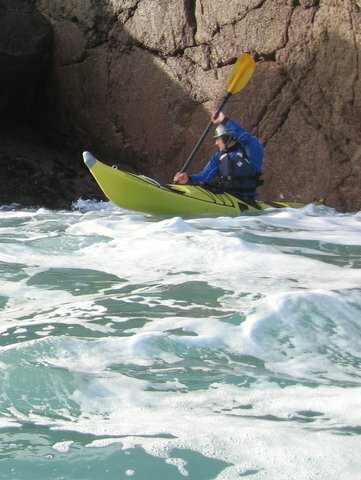 Jersey has a tidal range of almost 12m so the coastline is never the same and there is a huge range of sea kayaking experiences available whatever the weather. Jersey has a huge range of kayaking opportunities within 20 minutes travelling time. This makes the island an ideal venue for paddlers who want to get the most from their 4-star sea kayak leader assessment. Many paddlers add extra days to get more log book and leadership time and to familiarise themselves with our local waters. We can also arrange British Canoeing Guide Modules. Fly from Gatwick and UK regional airports. There are also connections from many European airports via Gatwick. In summer there are direct flights from Germany, Netherlands and Switzerland. High-speed ferry services operate from Poole, Portsmouth and St Malo (France). Make the most of your time on Jersey and use our kayaks at no extra charge. Our kayak fleet includes Valley Nordkapps, Avocets, Aquanaut, P&H Delphin, Hammer, Rockpool Taran, Tiderace Pace 17, Venture Kayaks Esky 15, Epic V5 and V7. Before you can attend the Sea Kayak Leader Assessment you must have completed a two-day Sea Kayak Leader training course (within the previous 3 years). Evidence that you have completed a sea kayak leader training course within the previous 3 years. Safety Training: Coastal Navigation & Tidal Planning or a similar Royal Yacht Association (RYA) course. A recognised 2-day First Aid Course completed within the last 3 years. VHF Marine radio licence (this is only needed if this is a requirement in your country). Membership of British Canoeing, CANI, SCA or WCA. Other awards may be accepted by British Canoeing providing they are of a similar standard to the above. If this is the case you will need to submit an Accredited Prior Learning form (APL) with your Leadership Registration form. You must register in advance with British Canoeing by completing the Leader Registration (LR) Form. Allow at least two weeks (longer if overseas) for your LR form to be processed and approved. If you arrive on a sea kayak leader assessment without an approved LR form you cannot be assessed. No refund of your assessment fees will be made. We often work with international clients and can help ensure you have the correct pre-requisites in place for your sea kayak leader assessment. Our French and German speaking staff can assist you with the translation of certificates into English and advise you in completing your sea kayak Leadership Registration (LR) form. 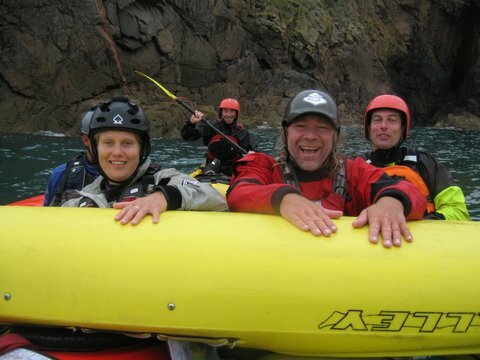 Contact us if you have any questions about completing your sea kayak leader (4 Star) assessment with Jersey Kayak Adventures. 2018 BCU (4-Star) Sea Kayak Leader training and assessment courses are listed here. Our top tips for the British Canoeing (BCU) 4-star sea kayak leader award will help you get the most from your training and assessment course. Dates and information about our advanced kayak courses and multi-day kayak trips. This article isn’t called how to PASS your four star sea kayak leader assessment – that’s down to you, and how you prepare, but by following these top tips and ideas written by Phil Hadley (with a few of my updates) it should help you in your consolidation between BC (4-star) sea kayak leader training and assessment. Note: The British Canoe Union (BCU) is now called British Canoeing (BC). From April 2017 the 4-star sea kayak award is called the Sea Kayak Leader (moderate or advanced water) award to reflect the content of the course. Your training course will be a good start on your path to a successful assessment, but there is no way, in two days you are going to learn everything required. The training course can only really give you an idea of what is expected of a sea kayak leader and help you to formulate your own action plan in order to get you ready to achieve that. Very few people can turn up to a two-day training then rock up to an assessment without doing anything in between and expect to pass – not unless you have loads of prior experience. Hopefully, you should come away from your training with an idea of your strong points, and more importantly what you need to work on. This is where the real work starts! 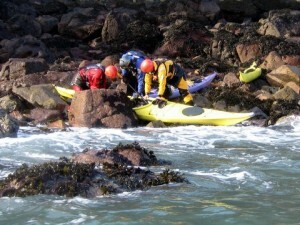 Sea Kayak Leader Training & Assessment Dates. The first thing is to reflect on what you have learned and to write down an action plan, formulate some goals and set yourself time limits on when you aim to achieve these goals. (At Jersey Kayak Adventures all students leave with a personal action plan). Keep in touch with your training provider, discuss your action plan and improvements with them, some may be willing for you come along to observe others being coached. Providers often need ‘mock’ students for assessments so offer to be one of these, it’s a great way to see different styles of leadership, see where the ‘benchmark’ is – who passes, who doesn’t, and it’s a great insight into how an assessment works. Don’t be afraid to drop other 4-star leader providers a polite email, most are more than willing to give advice and possibly assist in your development. Sea kayak skills in rough water. Video analysis. Go to your Home Nation website (British Canoeing, Canoe Wales, SCA, CANI, BCNA) and download all the sea kayak leader documents and read them thoroughly. These are the standards you will be assessed against. There’s a logbook that you can download, or you can produce your own. Whatever format you select make sure the assessor can see your personal paddling trips and any sea kayak leading you have done. If you paddle different disciplines try to have a section for each one. If you are thinking about getting into coaching, it’s a good idea to have a separate section for that too. You need to get into your kayak and get out paddling – lots! Practice your basic skills on flat-water to make sure that when you get onto moderate water your fundamental strokes are all intuitive, make sure you practice on both sides and put as much variety as you can into your drills. 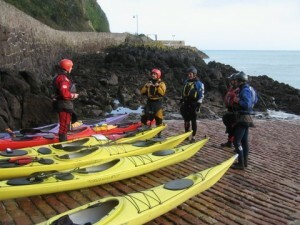 If you are short of time it may be worth considering adding extra training days to our sea kayak leader training course. We can also arrange training and assessment for the BC 3-Star sea kayak and Coastal Navigation & Tidal Planning (CNTP) certificate. Both are requirements for 4-star sea kayak leader. We can also offer BC guide training modules: Camp Craft and Expedition Skills, Customer Experience, Trip Planning and Organisation. Custom dates can be arranged. Email us. Get someone to observe you and give you feedback, if that proves difficult set up a video camera on a tripod and self-analyse your techniques. Don’t be afraid to get some specialist coaching. Just because you are working on the (4-star) sea kayak leader award don’t assume that you wouldn’t benefit from some flat-water coaching. Using Wing paddles and surfskis are a great way to tune up your forward paddling techniques. You need a large repertoire of techniques so that you are able to choose the most appropriate one in a skilful application when the need arises in a dynamic environment. Paddle other types of boats. Lots of good sea kayakers have found their paddle awareness has improved by paddling canoes. Slalom and/or surf kayaking is a great way to improve your boat positioning and ability to read water. Surf and white water is also a great place to develop a ‘bomb proof’ roll! We have a range of different craft including surf kayaks, sea kayaks and high-performance sea kayaks including Epic surfski designs. Plus a selection of Euro and Inuit style paddles. Most people who struggle with (4-star) sea kayak leader assessment often have weak logbooks in moderate water conditions. Make sure yours shows lots of trips at this level and lots of experience at leading different types of groups in the moderate water environment. Again, this may be a good reason to book a few extra days kayaking with us. There are quite a few aspirant level 5-coaches and trainee level three coaches who are looking for ‘long-term students’ – offering to be coached by these guys is a great way to get some quality coaching and it is always worth asking around. Again Internet paddling forums, Facebook etc can be very useful. The sea kayak leader(4-star) is a leadership award, so make sure you get plenty of practice at leading in these environments. We see quite a few candidates fail their assessment because they have only led novice paddlers or have wrongly assumed that because they do a lot of kayak coaching they have developed the leading skills that are required at the sea kayak leader level. Remember, this is a leadership award based on you leading paddlers who are around the 3-star level. Keep the group involved and part of the trip. Let those who clearly have the experience play an active role. Give a good briefing and involve the group. We find it helps if you have a system for your briefing such as Area, Boats and equipment, Communication, Doctor -health/medical matters-, Emergency matters/protocols. You can put this on a small card as ABCDE and use this to remind you. Keep this briefing short and concise as your students will want to get on the water! Remember to maintain good levels of Communication, Line of sight, Avoidance and select a Position of most usefulness (CLAP). Involve the paddlers in tricky areas so they “buddy up” or use “mirrors” so no one is ever out of sight. Consider the route all the time as you paddle along. Look well ahead for “future water” so you can shape your route in advance. Use protocols such as SAFER (Stop, Assess, Formulate a plan, Execute the plan i.e: do it, Reflect and modify) when looking at more tricky spots. It can take a long time to move a group through some sections and you might, therefore, need to adjust your plan/route based on the group size and experience. If you find you are taking a long time to explore a cave or rock garden some members of the group may lose interest. Active paddlers like to be doing something so keep people involved and feeling part of the group. If you opt for extra training days we can often arrange opportunities for you to lead more experienced paddlers. Ensure you are familiar with your equipment. Try out your new tow line before you need to use it for real in the training or assessment course. Remember, it is all very well to read about techniques and safety skills, however, you need to try them out for yourself to see if they will work for you. If you borrow gear and kayaks expect to be assessed as if they were your own. The Internet may be a great source of information but not all of the advice will be relevant to you and some is just wrong! Candidates are expected to have a VHF marine radio so make sure you know how it works. Carry it on your person and agree on a working channel if others in the group have a VHF with them. This makes communication between the group very easy and allows you to give advice e.g. when leading the group in through large surf or to communicate with a team member who has gone out of shouting range. If you are being assessed at this level incident will happen. 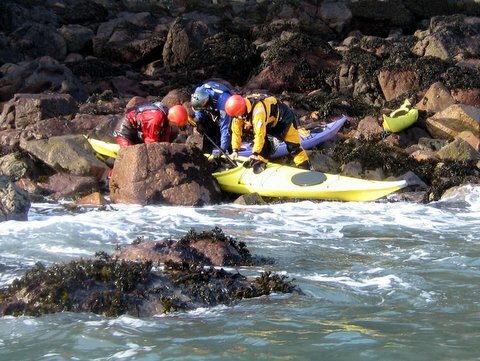 We have seen the following incident occur during our courses: broken paddles, lost hatches, damaged kayaks, paddlers needing tows, problems with using a kayak they had only just bought, a cut hand, capsizes in rock gardens, overestimating the group’s ability. None of these was set up by the assessors and the key message is to be prepared. Events can escalate rapidly. Remember your key priorities are: Self, Group, Swimmer, Equipment. Get this right and you are likely to deal with the incident well and impress your assessors. If you have completed a first aid or Foundation Safety & Rescue Training (FSRT) course this is going to be familiar to you. I avoid calling the paddler in difficulties a victim. This implies they are incapable of doing anything to rectify their predicament. Instead, I call them a swimmer -which is usually what they will be-. Another handy protocol is: Stop, Assess what is happening, Formulate a plan, Execute it (do it), Reflect on how it went afterwards. When paddlers often lead groups who are less experienced they can end up in an assessment thinking they are the ones who need to deal with any incidents. Remember, the sea kayak leader is not alone, others in the group may have sufficient experience and kit to help deal with an incident. Your role as a leader is to overseas the situation and in effect managing things. Get yourself involved in a tow and you risk being locked into the tow when further problems arise. For example, if others have tow lines get them involved in the tow to free you up to ensure others things do not start going wrong. This is a good reason to check what gear and experience your group has before going afloat. The assessment can be physically tiring, often entailing long drives to the course venue, paddling all day for two days, working evenings looking at plans for the next day, self-rescues and rescuing boats in moderate water. Assessors often see candidates flagging and losing performance towards the end of the two days – make sure you are as paddling fit as you can be. Try and give yourself a day before the assessment when you are not travelling to the course. We all lead busy lives so give yourself a bit of time out rather than plunge from a busy week at work on a Friday into the assessment on Saturday. Dealing with incidents afloat- a holed sea kayak. 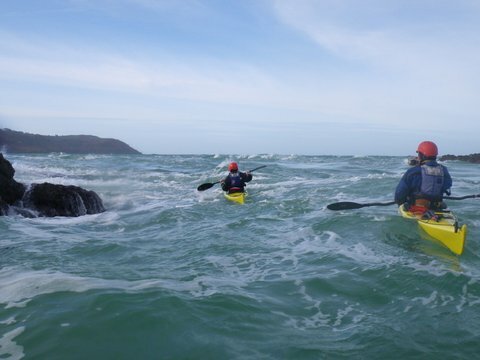 Ensure you have the correct safety course pre-requisites – Coastal Navigation and Tidal Planning is needed at sea kayak leader training and we can usually add this as an extra day. 3-star sea kayak is a good benchmark to have when going to the sea kayak leader training course. Again, we can assess this. Attending the training course doesn’t mean you are going to automatically have all the skills necessary for your assessment. They are training courses, and the techniques taught will need consolidation, there is a huge amount of information to be digested, and skills to be perfected. There is definitely a ‘use it or lose it’ phenomenon around these pre-requisite courses. Just because you used to be able to throw a throw line, perform a slick X rescue or plot a tidal passage doesn’t mean you will still be able to do it in two years time when you go for an assessment. Keep working on these skills and practice them in real conditions. You also need an up to date 16 hour First Aid. Try to do an outdoor one, like REC or the BCU Aquatic First Aid. We can sometimes arrange a 16-hour first aid course for you. You must be a BC member to undertake the sea kayak leader assessment and pay the Leadership Registration fee when sending in your LR form. British Canoeing will accept certificates from awarding bodies that are not on their list e.g. first aid, navigation, VHF awards. This often happens when non-UK residents want to be assessed. I am aware that in some European countries 16-hour First Aid courses are being phased out. My current advice is to submit an Accredited Prior Learning (APL) from with a copy of your certificate and the course syllabus. BC HQ can then decide if it meets the standards required. If you need to fill in an Accredited Prior Learning (APL) form send a copy of your certificate and course syllabus (in English) to BC HQ. Contact me and I can usually give advice. Fill your LR form in as instructed and send it with the correct fee back to your Home Nation. After checking all the info is correct, they will send the form back to you stamped for assessment. You must hand the stamped LR form to the assessment director before your assessment. No LR form, no assessment! Note: Non-UK candidates will need to complete the International Leadership registration form. Dates of our 4-star sea kayak leader and advanced courses. Written by Phil Hadley, BCU Coach and (4 star) moderate water Canoe and Sea Kayak assessor with additions added by Derek Hairon (2018). Remember many sea kayakers attend (4 star) moderate water sea kayak leader training courses as a means of gaining more experience of paddling in different waters and conditions. Training courses are not just for paddlers who plan to go for an assessment. You can find more information about our (4 star) sea kayak leader training and assessment courses as well as Coastal Navigation and Tidal Planning here.